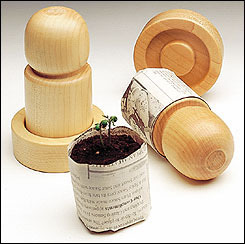 It is simply a wooden dowel with a complementary base that allows you to quickly and easily form paper pots that are about 2" in diameter. Several companies now sell these, but I believe the original was created by the owners of Richter's Herbs. I found mine at Lee Valley Tools and bought it for myself for Christmas (it didn't matter that it was February). The device is easy to use and allows you to make as many pots as you need very easily. Even my five-year-old had no problem churning out a significant number of pots! Because you can use newsprint, it is very economical, and it saves you from the necessity of storing your plastic pots when not in use. The pots made by this particular item are the perfect size for seed starting, and you can really cram them into a standard seed flat. Because the pots are not attached to each other like the smaller seedling cells are, you can remove them from your warm, covered tray and place them under lights as soon as they sprout, without needing to uncover seeds that have not come up yet. This is all very efficient and convenient! Unfortunately, I discovered that the paper pots are a delicious source of food to mould and fungus. Seeds that I placed on a heat mat and under a humidity dome sprouted quickly, but the pots had a layer of white fuzz around them within two days. Other pots that were not on heat took longer, but almost all developed some kind of mould. Removing the humidity dome and spacing the pots out to prevent moisture from building up has improved the situation somewhat, but this seems to be a problem that will be ongoing. It appears that to avoid problems with mould, paper pots should be watered even more carefully than plastic. Because they don't have drainage holes, they tend to rely on the porous nature of the sides to shed excess moisture. If the pots are spaced too closely together, the soil may become waterlogged and the pots will sprout mould. If they are spaced far apart, however, they tend to dry out quickly, which causes other problems for delicate seedlings. If the pots cannot be spaced adequately, punching drainage holes in the bottom before planting might help. Using these paper pots under a humidity dome definitely exasperates the problem, but holding in moisture is a major benefit to sprouting seeds. Although I love the idea of these paper pots, the reality has been less ideal. Hopefully, I will be able to find a way to continue to use these. For now, I will be spacing the pots out and transplanting most plants into plastic pots and other recycled plastic containers. i will share this to my friends.... thanks for posting..
Dear Cassandra, your post has one thing that caught my attention! Its information is more useful than many other articles on this topic. Anyway, can you extend your supports a little more with the Paper Pots Cons That would be a great help to our website Sandersreview and most of its potential readers.